Erwin Zijleman's review of Natalie Ramsey's album 'Fly to home' (http://wonomagazine.blogspot.nl/2014/12/fly-to-home-natalie-ramsay.html) brought me to her Bandcamp site. 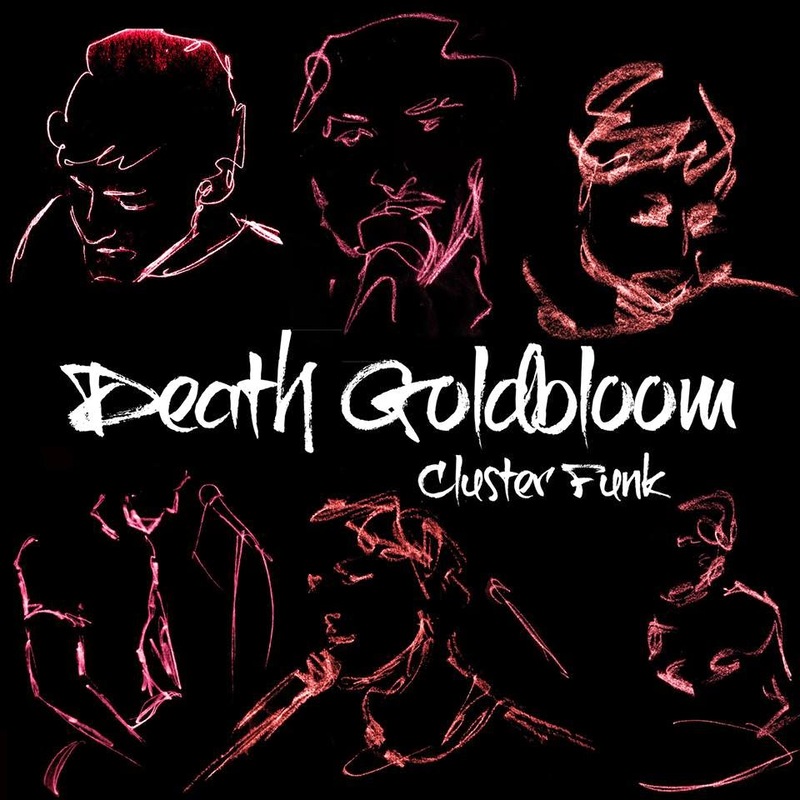 Through her recommendation I got to the album of Death Goldbloom. That association is a great way to discover things was proven once again. Cluster Funk is a great EP that is worth checking out by anyone with a love for rock mixed with some pop elements, some sprinkling of desert sand mixed with a sidestep to a violin laden ballad of one minute. Death Goldbloom takes the listener on a rollercoaster ride that he is not likely to forget. From a great high to a low, shaken up a bit and an unexpected rest in the middle before you're pulled back up again. Death Goldbloom is from Vancouver, B.C. and consists of singer/guitarist Tim Claridge and drummer Tomek. Together they fill up the whole cd. There is one name that comes to mind regularly while listening to the duo: Masters of Reality. This stoner rock band is a point of reference from which Death Goldbloom takes its departure. In music and singing, although Tim Claridge's voice is slightly deeper, but just as relaxed or even more relaxed sounding than Chris Goss. The other reference is the blues. Not the strict 12 bar variety, no, the atmosphere of blues and pure vibes. Like in '66th & Crimson'. Soft, relaxed and bluesy. Other instruments come in and Natalie Ramsey singing background vocals. The contrast with '616 (Satanic Subterranean Tapdance Extravaganza)' can hardly be larger. A real stone rocker, with some sluggish guitars that still manage to be alive enough to cook up a storm. I love this song. There's a contrast within the song itself also. The large rock sound and the "soft" singing blend so well. Claridge sings like it doesn't cost him any effort. A combination that is very attractive for the simple reason it makes '616 (Satanic Subterranean Tapdance Extravaganza)' a real song. Death Goldbloom can totally rock out, and it does, and still play a melodic song, which I don't mind putting my arms around. With 'Already gone' the band shows straight up that it won't let itself be caught in one hole. The soft acoustic sounding start, the large, blown up instrumental interludes with some great electric blues runs and riffs, somewhat The White Stripes influenced but again enough its own. A song that must be great to listen to in a live setting. The fun becomes even better when the guitars go into overdrive. The devil makes an appearance and 666 and hell are referred to later. Is the 2014 crossroad on the corner of 66 and Crimson? The devil went down to Vancouver, B.C.? Good on you, Tim Claridge. We'll have mercy on you come that time. The muted guitars in 'Have mercy on me' show that these are in part a signature sound of Death Goldbloom. Another great stonerrocker with a blues injection. The surprise comes later when the volume goes down and a violin comes in, showing that this band is more than a rocking machine. It is by this time that I realise that I've become a fan. Like with the first two Masters of Reality albums. Death Goldbloom has the same sort of effect on me. Cluster funk is an album that holds many a secret and many an interesting turn. A turn like 'Tokyo Rose' that is extremely poppy, with a subdued but harsh guitar solo that gives the song something nasty, like a snarling dog in a courtyard you know have to cross at some stage. I love surprises and I'm happy that I'm curious enough to follow a recommendation of a singer I had never heard of until I prepared putting Erwin's review of her album on the blog. That combination brought me to where we are now. A review of a great and varied EP that makes me curious the more as to what is to follow in 2015. 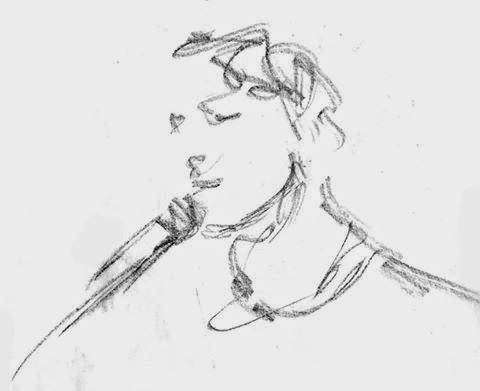 And tomorrow you can find my review of Natalie Ramsay's album on this blog. The two albums can not be more different in music, but have one thing in common: brilliance!